Two tacos made with beer-battered Wild Alaska Pollock, our original white sauce, mild salsa and cabbage. Served on stone-ground stone tortillas with "no-fried" pinto beans and tortilla chips. 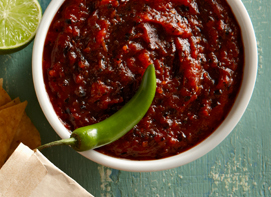 Fire-roasted tomatoes, smoky red and jalapeño chiles, and lime juice come together to form this richly dynamic salsa. While you can pair it with everything on the menu, it’s especially delicious with our chicken and steak offerings. Cheese, fresh guacamole, sour cream, salsa fresca & chips. 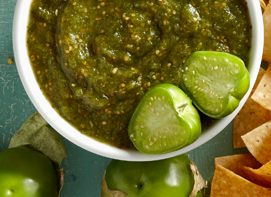 Made with tomatillos, jalapeños, cilantro, garlic, and onion, this green goodness has a subtle heat and a fresh, light taste. 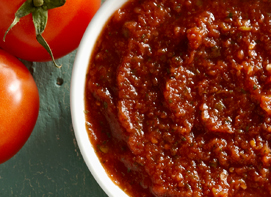 With a rich, fresh flavor from vine-ripened tomatoes, white onions, cilantro and a hint of heat from jalapeño chiles, this is the jack-of-all-trades at our salsa bar. It’s great with chips and just about anything else. Sustainable wild Alaska Pollock, caught in Alaska's ocean waters, hand-dipped in our signature seasoned beer batter and cooked to crispy perfection. Topped with Rubio's white sauce, mild salsa and fresh cabbage. Served on a warm stone-ground corn tortilla and garnished with a slice of lime. Two tacos made with beer-battered Wild Alaska Pollock, fresh guacamole, cheese, our original white sauce, mild salsa, cilantro, onion and cabbage. Served on stone-ground stone tortillas with "no-fried" pinto beans and tortilla chips. The Original Fish Taco® topped with our handmade guacamole, a blend of cheeses and a cilantro/onion mix. Served on a warm stone-ground corn tortilla and garnished with a slice of lime. -The Original Fish Taco® - Our signature recipe that started it all in 1983.-Salsa Verde Shrimp Taco - Shrimp, pan-seared and topped with salsa verde.-Regal Springs® Tilapia Taco - Grilled or Blackened Regal Springs Tilapia topped with creamy chipotle sauce and Serrano slaw. Mango salsa, guacamole, cabbage and chipotle sauce on a flour tortilla. Fresh guacamole, cheese, salsa fresca & lettuce. Toasted cheese, all natural bacon, avocado, blackened jalapenos, citrus rice, salsa fresca, roasted chipotle salsa and chipotle sauce. All natural steak, seasoned fries, guacamole, melted cheese, salsa fresca and chipotle sauce. Cheese, tortilla strips, salsa fresca, cabbage, romaine lettuce & chipotle ranch dressing. Your choice of seafood or grilled all natural chicken atop our new brown rice & quinoa and romaine lettuce, topped with fire-roasted veggies, fresh sliced Hass avocados, black beans, cilantro lime mojo sauce and toasted almonds. Kids meals include a free small fountain drink. 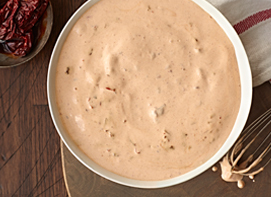 Inspired by the fish tacos in Baja, this signature sauce has been with us from the beginning. 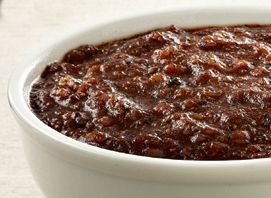 It's light and creamy flavor offer a cooling contrast to the heat of our chiles and salsas. Crafted with ripe, red tomatoes and mixed with a blend of toasted, crushed red chiles, this Puerto Nuevo inspired salsa is the perfect complement to The Original Fish Taco® and Fish Taco Especial. Made in-house daily, it features diced Roma tomatoes, white onions, cilantro, jalapeno and Serrano chiles, lime zest, oregano, and just a pinch of sea salt. Large orders may take more time to fulfill. This will not be reflected in your estimated delivery time if ASAP ordering. Serves 5-7. Build-your-own taco bar with grilled all natural chicken, steak or beer-battered fish (choose 1) plus "no-fried" pinto beans℠, Mexican or citrus rice, cheese, lettuce, guacamole, our signature salsas, tortillas and chips. Serves 10-12. Build-your-own taco bar with grilled all natural chicken, steak or beer-battered fish (choose any 2) plus "no-fried" pinto beans℠, Mexican or citrus rice, cheese, lettuce, guacamole, our signature salsas, tortillas and chips. Serves 10-12. Includes regular size taco bar, any salad and a Cookie Box or Sweet Treats Box for dessert. Add all natural chicken or seafood to salad for an additional cost.